Spray large nonstick skillet with nonstick cooking spray. Heat over medium-high heat until hot. Add beef; cook and stir until browned. Remove beef from skillet; cover to keep warm. In same skillet, combine onion and carrots; cook and stir 2 minutes. Stir in broth, stir-fry sauce and honey. Bring to a boil. Reduce heat to medium-low; cover and cook 5 to 10 minutes or until vegetables are crisp-tender. 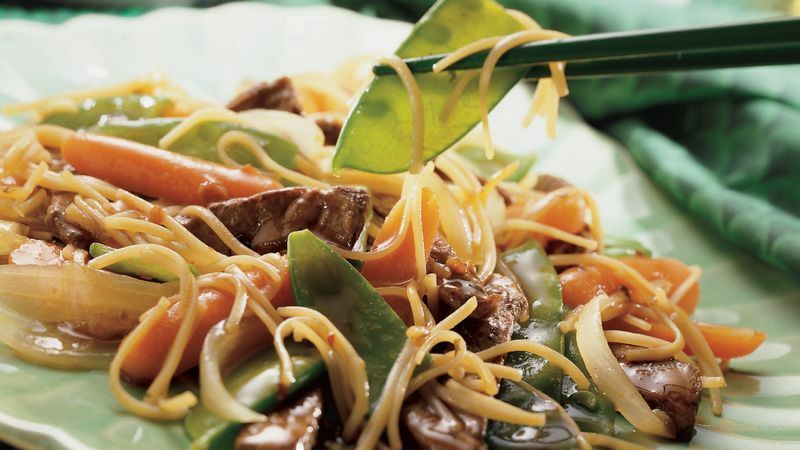 Stir in egg noodles; cover and cook 5 to 10 minutes or until noodles are tender, stirring occasionally. Add beef and pea pods; cover and cook 3 to 4 minutes or until pea pods are crisp-tender. Sprinkle with cashews.